In a local matchup and California Collegiate Athletic Association competition, the No. 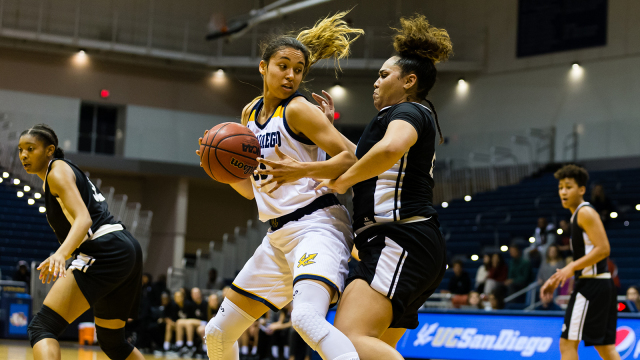 5 UC San Diego women’s basketball team collected it’s 15th win this season in a double overtime thriller against California State University, San Marcos, winning 68–67 on Saturday, Jan. 19. Prior to tipoff, junior forward Mikayla Williams was acknowledged for joining the 1,000-point club in a Triton uniform. Throughout the night, Williams demonstrated the skills that helped her reach the milestone, scoring 24 points in the win on 10–18 shooting from the field and 4–5 shooting from the free throw line. The Meath Park, Saskatchewan native did more than just score, totaling 18 rebounds as well as 6 blocks. Per usual, the Tritons knew how to keep things interesting. After a slow start, the blue and gold trailed by eight after the first quarter and maintained that deficit heading into halftime, down 24–32. Regardless of the somewhat sloppy first half, UCSD came out of the locker room ready to defend. The Tritons held the Cougars to single digits in every quarter for the remainder of the game, allowing just 4 points in the third quarter. In her first game back at RIMAC Arena following a shoulder injury, senior guard Kayla Sato put on a show. Sato recorded 20 points, 2 steals, and 3 rebounds. In addition, senior guard Joleen Yang and junior forward Haleigh Hatfield each dropped 7 points apiece. Hatfield was also big on the boards, tallying 17 rebounds on top of 3 blocks in her impressive 48 minutes of play. With two seconds left of the first overtime, a contested yet capitalized layup from the Cougars extended the contest into double overtime. Despite the letdown, the gritty Triton squad continued to battle. Leading in rebounds, second chance opportunities, and points in the paint, UCSD found a way to come out on top just as it has done all season long, ultimately outscoring San Marcos 6–5 in the second overtime. As a team, the Tritons gradually improved their field goal shooting percentage throughout the entirety of the game, hitting just 28.6 percent of their shots in the first half before shooting 36.7 percent in the second half. In the two overtimes combined, the Tritons shot their best yet, 41.7 percent (5–12), compared to the Cougars 25 percent (4–16), a difference that helped seal the win for the Tritons. With the win, UCSD improves its record to 15–0 overall and to 11–0 in conference play. The Tritons will travel north next week to take on California State University, Chico on Thursday, Jan. 24 and California State University, Humboldt on Saturday, Jan. 26. Tipoff will begin at 5:30 p.m. for both games.